Any woman can wear white jeans! Today I am happy to share with you m favorite ways of wearing white skinny jeans in day and evening time. What do I like about white skinnies is the stunning look that brightens up your overall outfit and makes you stand out from the crowd. I tell you honestly, at first I was afraid of wearing white jeans, as I thought they gonna be dirty in seconds, but then I thought to myself, the life is short, so I better wear them and look fabulous! This garment is one of those wardrobe staples that everyone must own, really! Use these looks as inspiration for your Spring wardrobe. A good pair of white skinnies will for sure turn your life around. Why? Because they look fresh and pretty! They can look unexpected during summer and winter seasons. I have rounded up easy styling tips how you can make white bottoms look perfect and voguish. I think white styles are ideal opposites to classic blue colored jeans. Here are gathered beautiful ladies and fashion influencers who illustrate fresh ways to style white bottoms in your everyday life. I know, I’ve been talking a lot about various denim trends, but the white skinnies are here to stay for a quite long time. You can look ideal by pairing flannel or tartan shirt with your chic white skinnies, or you can go for a fitted navy blazer to create a professional look. Personally, I like adding neon colors, black tops, and classy accessories. I know girls who do white-on-white making that special effect of a superstar look. You can go wrong by adding a chambray shirt that looks effortless and casual. Of course, if you want to make it more casual, then I recommend to try on camouflage print that will look really cool with white skinny bottoms. All in all, here are my favorite looks and style tips on how to wear white jeans. Love this look that features a gray beanie, suede blue biker jacket draped over cozy sweater teamed with white skinny jeans and black leather ankle boots. check my post on the best beanies for women, you will see mind blowing looks that are easy to wear and style in real life. Here we see a light wash blue denim jacket worn over white crop top teamed with high waisted white skinny jeans and silver metallic criss-cross platform sandals. Speaking of denim, I recommend to checkmy article about denim jackets for women, you are about to see fresh ways how to combine this jean outerwear piece with the rest of your clothes. 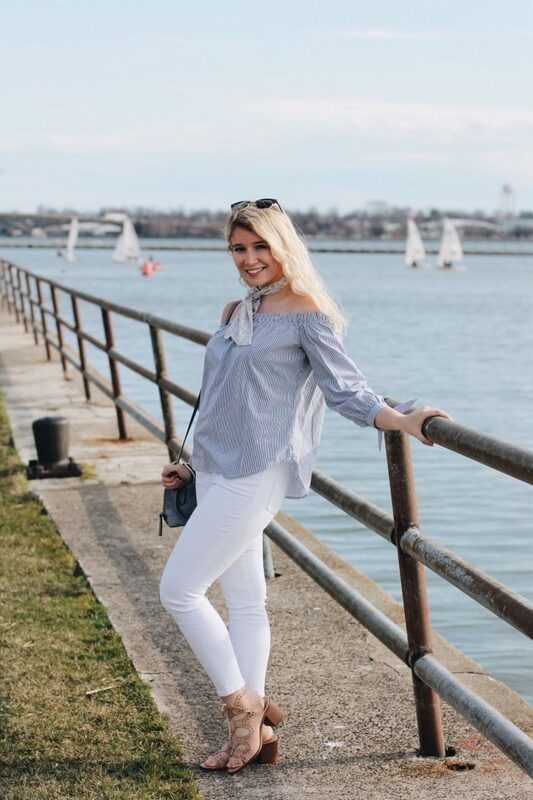 Do You have any thoughts about White Skinny Jeans For Women Best Street Style Inspo? Here are Fashion Tips pictures and trendy women’s outfits which are in style in 2019: Best Women's Skinny Jeans, Denim, Denim Trends For Women, Must Have Fashion Trends For Women, Street Style Women's Fashion And Inspiration, White Skinny Jeans and tips on how to wear them on the streets.